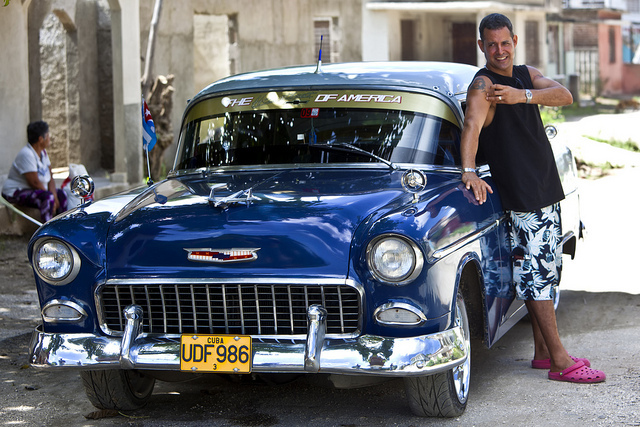 A gentleman proudly showcasing his classic blue Chevy outside his home in Holguín. The city is warm, welcoming, filled with Spanish colonial charm, and has just the right balance of culture and easiness, that you feel as though you are one of a few to ever discover this amazing place. American tourists rarely frequent this off-the-beaten path city destination. I walked into a paladar, recommended by my bicycle taxi driver, and sat down for dinner. The waiter asked where I was from. When I told him the US, he was so excited. The owners came out to sit down and have dinner with me. They explained that they had never served an American in their home and they wanted to be part of such an honor. Little did they know the honor was all mine. Intersting in visiting Holguín and other eastern Cuba destinations? Travel to Cuba on our Undiscovered Cuba tour for a 13 day excursion you will cherish forever.